England's Chris Wood finished fifth on 17 under par with English pair Lee Westwood and Danny Willett and Wales' Jamie Donaldson tied for 11th on 12-under, with Ian Poulter and Richard Bland a shot further back. 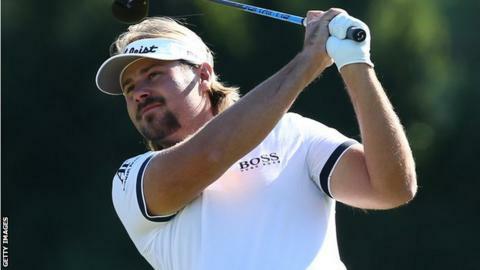 Dubuisson and Van Zyl, the joint overnight leaders, were tied when they teed off on the 18th after the Frenchman had recovered from a double bogey on the fifth, chipped in for an eagle on the 11th and birdied the 15th and 17th. After Van Zyl parred the 18th, it left Dubuisson two shots to win the tournament and he was down for a birdie to spark emotional celebrations. It was the second Turkish Open win in three years for Dubuisson after victory in 2013 - those two successes being his only European Tour titles. He broke down in tears at the end, after a year that has seen him fall out of the world's top 50. "It's been so hard," he said. "I've wanted to play this year, but there's been many times when I haven't been able to for personal reasons. That is why I am so emotional. "This win has given me my confidence back, I lost it a few months ago and felt like my game would never come back, but this week I realised my game is still here." The Turkish Open is the first of four tournaments in the European Tour's Final Series, the climax to the Race to Dubai. Dubuisson's win moves him up to seventh in those rankings, while Northern Ireland's McIlroy remains first, 399,385 points ahead of Willett in second. The next tournament is the WGC-HSBC Champions in Shanghai on 8 November. Four-time major winner McIlroy, 26, said: "It was not the finish I wanted but I feel like I've seen good enough signs this week to suggest I can play well the next couple. "I felt like I hit some good putts that didn't go in but I made a couple of bad strokes on the back nine. "That's still a work in progres,s and I need to keep trying to improve on that part and keep going forward."